Bright colours, complex patterns, completely personalised and top-class. Sublimation allows for incredible designs and patterns. The sublimation process takes polyester fabrics and uses a heat transfer process to dye the material into precise shapes and colours. The process means we can achieve amazingly precise and detailed outcomes. Sublimated polos are perfect for sports, tours, house shirts, graduation and senior shirts and are increasingly being used for everyday school wear. 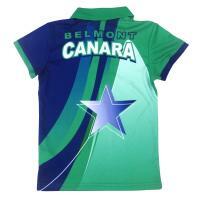 See some examples of our sublimated polos below. Because the process is so highly personalised and tailored, please do contact us to start talking about what we can achieve for your school.